Clark J. Adams was graduated from the University of Michigan, having obtained his A.B. and his J.D. degrees. He married Adeline Adams in June of 1929. He practiced law in the City of Pontiac with C. Bryan Kinney, and in 1936, 1938, and again in 1940 he was elected to the Michigan House of Representatives. He served as G. Mennen Williams’ legal advisor during Williams’ service as Governor. 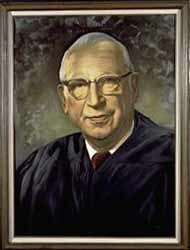 Adams was appointed to the Michigan Supreme Court on August 14, 1952, to fill a vacancy caused by the death of Justice Walter H. North. Adams served on the Court until December 31, 1953, having been victorious in the November 1952 election over two opponents, but then defeated in the April 1953 election by Justices Dethmers and Kelly. Following his work on the Michigan Supreme Court, Adams was appointed to the Oakland County Circuit Court by Governor G. Mennen Williams to fill a newly created seat. Adams often felt that his position as a Judge of the Oakland County Circuit Court was “the best job in the world.” He thoroughly enjoyed his work on the Circuit Court. There were many judges’ meetings where, after long debate on a particular subject, Adams would give his reasoned logic as to what his position was and why, and almost without exception his viewpoint would carry the day as a result of his remarks. Adams was very faithful and would meet every appointment he made, unless it was on November 15. Deer season was sacred, and as a consequence there could be no violation of his right to attend to the most important business of that day.